We have been gifted a VERY premium defender this year. Are there some risks though? So before we get started I’m going to confess to having a bit of a man crush on this guy which all started back when I wrote a Deck of DT piece on him in the 2015 preseason. In this piece I made some big calls and triggered a decent debate in the comment section (which you can read here if you’re feeling nostalgic). Back then Adams had come off a season averaging 70 and I thought he had the potential to lift his average to 95-100. Fast forward 2 years and I think Adams still has room to grow. As a defender, Adams is as close to a lock as you’ll get and as such was my first selected player this year. But after posting an average of 102.9 last year it has also made him the highest priced defender coming in at $622,000. While this is a lot of cash to be spending on a player I do believe that there is still growth left in Adams. This belief is based on the fact that after returning from injury to play his last 6 games of the season Adams went at an impressive 107.5 average including a massive 140 against West Coast! Before Adams injury last year he was being rotated through the sweeping half back position with Pendlebury, which is what earned him the Def eligibility but also caused his score to suffer more on certain games. On his return from injury after sitting out rounds 11 – 15, the Magpies having identified that they were getting beaten up in the midfield then injected Adams back in to more centre bounces. Adams brings a solid body midfield type that Collingwood used to rely heavily on Swan to provide while leaving Pendlebury and Treloar to be fancy accumulators of the ball, Adams gets in and gets first hands on the ball. Unfortunately while playing this role, his kick to handball ratio will slide more towards the non fantasy friendly handball end of the spectrum but his tackling in the clenches and ability to get his hands on the ball more often will certainly make up for it. That 140 mentioned earlier against West Coast was helped with a massive 11 tackles! Last year from 14 games Adams only went below 100 points 5 times, with 2 of these scores in the 90’s, 2 in the 80’s and an injury affected 74. Considering the year earlier saw Adams with 9 scores below 100, 3 of which were below 70, I think there’s a pattern and evidence to suggest that Adams is still growing as a player and we will see that reflected in a higher average if he can stay on the park! 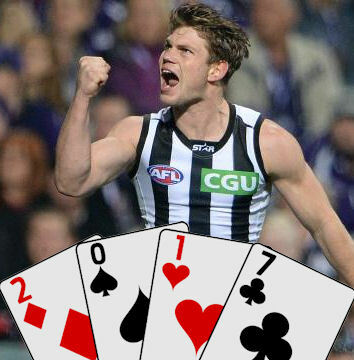 First up, in his 3 seasons playing for Collingwood, the most games he has played in a row before missing a game is 7. Out of a possible 68 he’s played 43. While he’s toned down/aimed his aggression a fair amount (last year was the first season since his debut in 2012 where he wasn’t suspended) he has spent a lot of time missing games through injuries. Last year alone he missed 2 games with a knee injury, 5 games with a hamstring injury and then the last 2 games of the season with an ankle injury. The last 2 also occurred in game which reduced his scoring output for those rounds. While AFL Fantasy gives us the luxury of 2 trades each week, he may not be worth the risk in other formats where you may be forced to carry him on your bench or wear a loss of cash as you watch him limp from the ground as he failed to reach his breakeven. The next reason which may scare you off Adams is where Buckley will be placing him on the magnet board. While it’s absolutely obvious to everyone that Adams’ best games are when he’s allowed to run free through the middle, Buckley may still have other plans in mind. Collingwood has a plethora of young midfield talent to choose from which means Buckley can afford to swing Adams wherever he likes. I mentioned above how Buckley had used Adams to swing across the halfback line but this isn’t a massive worry as Adams will generally still find the ball and post a decent score. The worry is if Buckley decides he’d like to use Adams as a tagger again. While I thought we’d seen the last of Adams being forced to tag in 2014 after he showed how he can carve it up through the middle, Buckley has thrown a nice bit of doubt into our minds by sending Adams to Dahlhaus in his last game last season. This was just 2 games after his 36 disposal, 8 clearance, 11 tackle masterclass against West Coast. Unfortunately Adams takes his tagging very seriously and does sacrifice his game to try negate his opponent and this results in a lower fantasy score. Dahlhaus proved far too quick for Adams on this occasion but who knows if and when Buckley will try this again. Which brings me to my next point, Standard Deviation. A players Standard Deviation is how far or little a players score will deviate from their average. The players with a small standard deviation are the ones that you can generally trust to get you over the line in a head to head round. A great example would be someone like Matthew Boyd, who you can generally expect to land you a score between 95 – 115. Adam’s deviation however looks more like a rollercoaster and has for every season of his career so far. While last year was a step in the right direction with his lowest score being only 74, if Buckley continues to throw Adams around into different roles every few game it will be very hard to see the kind of consistency that you can rely on. Finally, my last reason not to pick Adams is for a POD. Currently Adams is sitting in roughly 8 out of 10 teams (this is a wild non fact checked stat) which would mean not selecting Adams is the point of difference your team can have. Meaning that if Adams’ injury woes continues next season, while 80% (once again, estimated) of coaches are scrambling for replacements or having to carry him on their bench for a week or 2, you’ll be free to use your trades elsewhere or not have to rely on a rookie for cover. KING – I think the only thing holding Adams back from being an ACE right now is his own body. He’ll stay locked in my team however and I’ll be hoping this is the season where he stays injury free and becomes the premium fantasy scorer he’s shown glimpses of being! How many games does Taylor Adams play in 2017? FOLLOW ME ON TWITTER: @anthonydsmith86 for all thing AFL Fantasy (and more). Got something to say about the deck? Use the hashtag… #DeckofDT. 110 is too high i think for Adams, only 6 players who played more than 2 games got 110+ average last year and only 17 got 105+ average. I can see Adams at 105, but with Pendles and Trelor doing the same thing in that team, I won’t be surprised if he stays at current average. That said he is still in my side. Definitely worried about his durability. I keep taking him out of my team and bringing him back in…. Concerns are completely valid but I can’t not take him. At least if he breaks down pretty much everyone is going to be in the same boat, just can’t justify passing on him for the sense of smug satisfaction that comes from a lucky guess and “I told ya so”. Waiting for Aye-Aye to comment! I could see him averaging 110 if he can not get injured, but one injury on a low score will push his average below 110, and i can’t see him not getting injured.